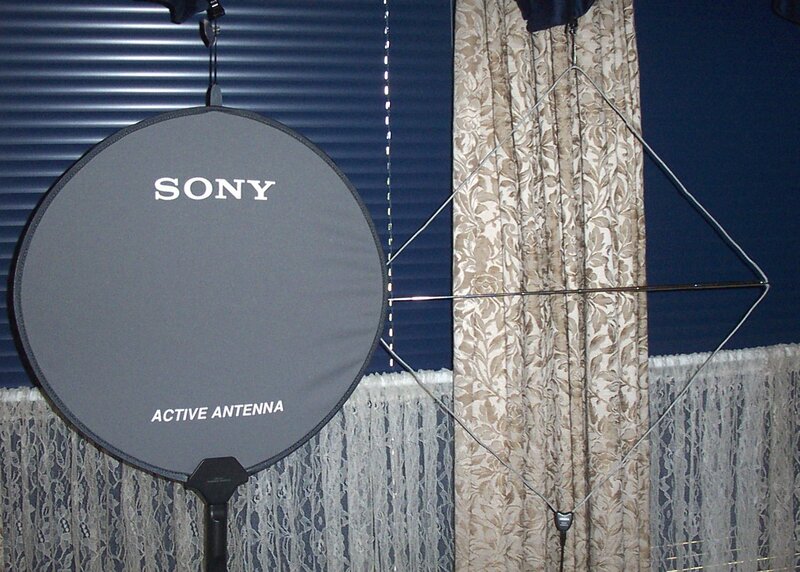 I just finished a few days of comparisons between the inexpensive, new Degen DE31 Active Loop SW antenna and the well-known Sony ANLP-1 Active Loop. Both are SW only Active Loop antennas. 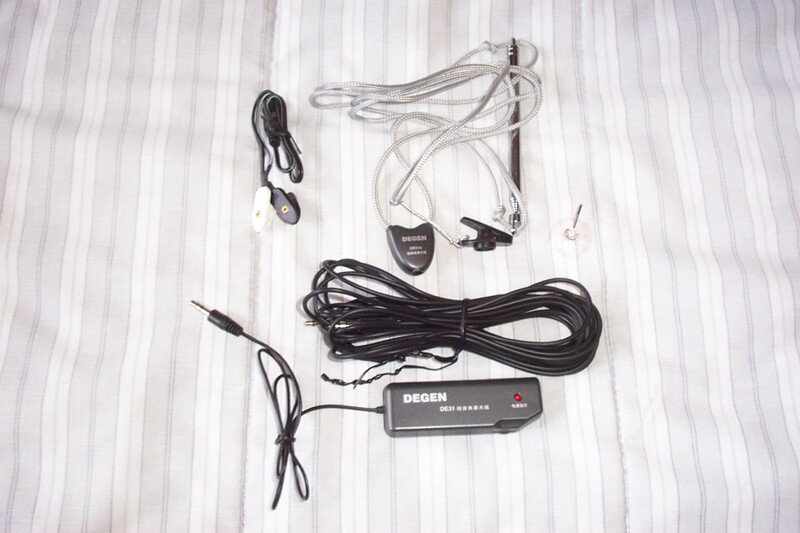 Each consists of a folding loop (so they are easy to travel with), an approximate 15 foot lead-in cable, a battery-equipped interface/controller box and output to a standard 1/8″ mini plug, or via adapters to bare wires of alligators for clipping directly to a whip antenna. Each is supplied with a suction cup and a clothespin type clip for easy hanging in a window. The Sony is also provided with an optional plug-in noise reducer unit. Each of these antennas are designed primarily to help when you are in a building which blocks the shortwave signal from you, such as a hotel, an office, an apartment building or a motor home. 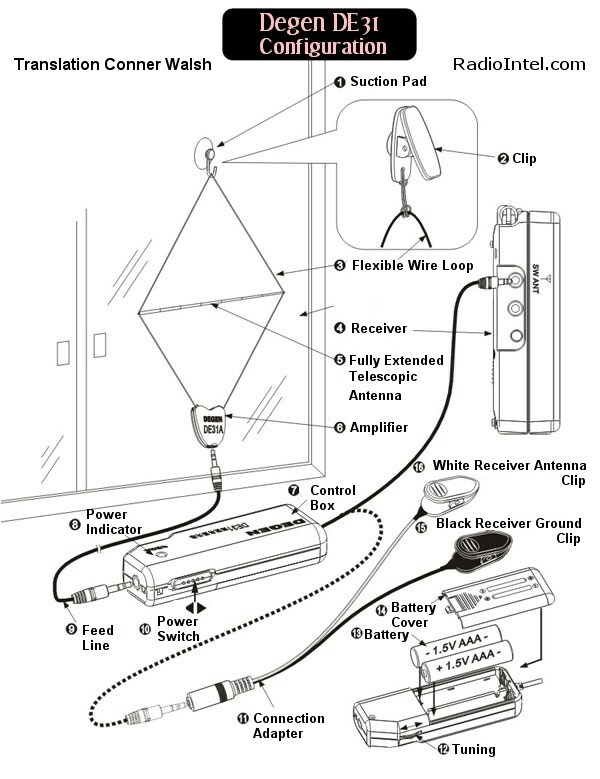 In these cases the loop is hung in a window and reception is similar to being outside with your radio. This is often referred to in antenna parlance as “importing” a signal…bringing it into an area where it doesn’t make it on its own. In wood frame construction you don’t have this attenuation (unless you happen to have foil faced insulation or aluminum siding) so the signals can freely reach your portable radio’s whip antenna. However, these loops have a secondary use…since they are “active”, meaning they are “amplified” antennas, they can deliver a stronger signal to your radio to improve weak signal reception. Also, loop antennas tend to reduce local interference because they ignore the electrical component of the rf signal, picking up only the magnetic element which means they can ignore some of the noise. And finally each has a pre-selector which allows you to peak the desired frequency and ignore others…this should help prevent overload and spurious signals. How much of an increase in reception you get in this mode somewhat depends on your listening environment and your radio – some improve much more than others with these two antennas. In general, the more sensitive your radio is on its own, the LESS it will benefit from one of these antennas. However, ALL the radios tested showed at least some improvement with both of the antennas, and as such, they are of interest to the sw listener. How Are They Similar & How Are They Different? 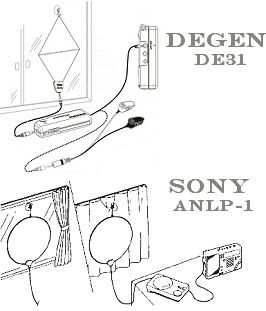 If you aren’t familiar with the Sony ANLP-1, it is an amazing piece of wizardry only Sony could have come up with. When you remove it from its draw-string carrying pouch, you untwist it and it springs open to three times its folded size. You feel like saying “Voila!” as you open it, much as a magician producing a bouquet of flowers from his sleeve. The combination suction cup/clothes-pin mounting clip is permanently attached to the loop so it won’t get lost. The Control/Interface box features a reel type cord storage device which makes packing up a quick process. This control box holds two AA batteries, and has an On/Off/Standby switch, a multi-position click wheel for band selection and an LED power indicator. 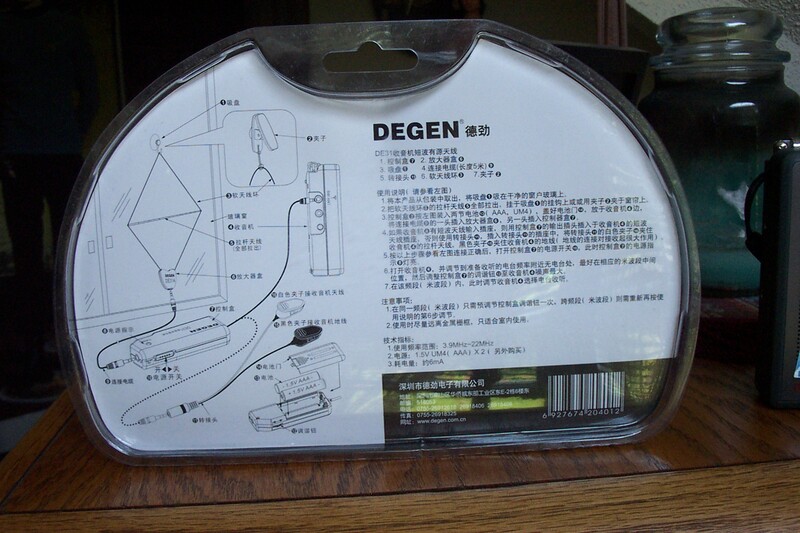 The Degen, by comparison, is delivered in a no-frills blister pack package and no carrying pouch is provided so you must come up with one to hold the loose parts if you plan to travel with the unit. The loop itself looks like a piece of rope…the actual loop wires are hidden inside the fabric…it’s kind of cool. There is a horizontal support brace made from a modified whip antenna. This is not an electrical part of the antenna…it is there for support only. It holds the deployed loop in a square shape with the corners at the top, bottom, left and right sides, and it telescopes down to 6 inches for stowing. 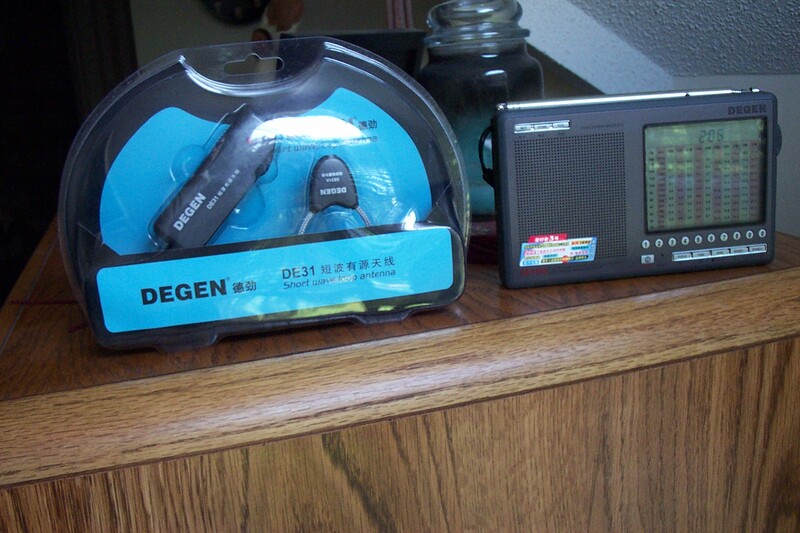 The Degen Interface/Control box holds two AAA cells and is very small…about the size of a disposable lighter compared with the Sony’s cigarette-pack sized controller box. It also has a power LED and On/Off switch. 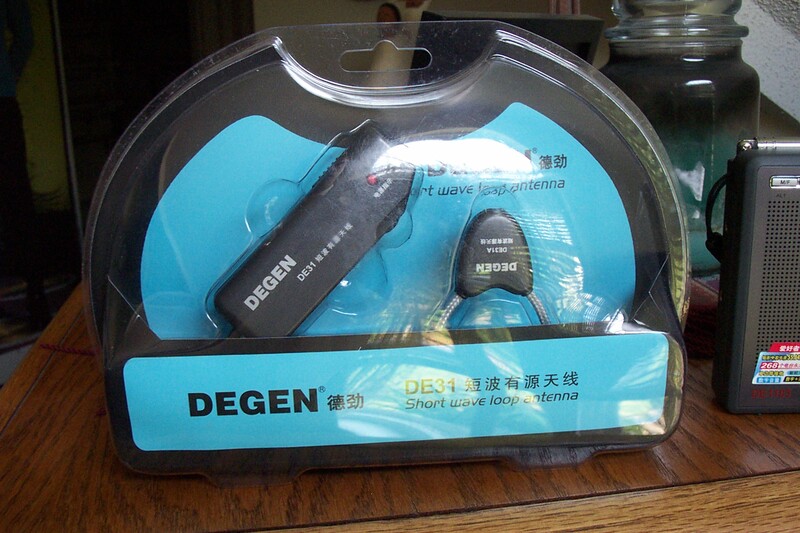 The frequency adjustment on the Degen is not marked and is a somewhat touchy thumb-wheel, although it offers continuous adjustment with no click stops, and may therefore provide more consistent signal peaking than the click-stop Sony tuning dial. The Sony’s dial has 11 click-stops marked in MHz and is very easy to set. The Degen control box also offers slightly more lead length between the box and the radio…a small point but a convenience nonetheless. 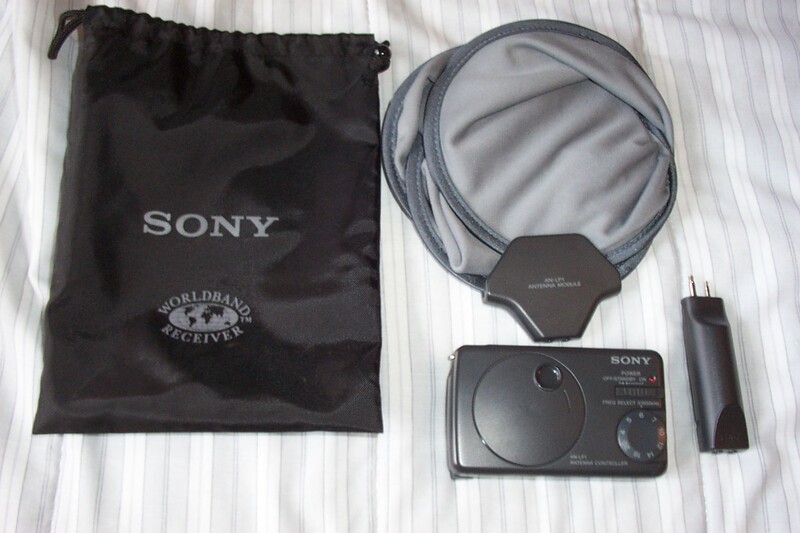 Finally, the Sony has the ability to switch itself on and off automatically when connected to certain Sony radios, such as the 7600GR. This is primarily a convenience feature when using the Timer functions of the Sony radios as they can turn the antenna off when the radio turns off thus saving your antenna batteries. (It is a common misconception that in this case, the radio is powering the antenna. This is not true! The trigger voltage present at the 7600GR’s antenna jack simply “signals” the antenna to turn on or off…when the ANLP-1is on it draws its power form its internal batteries). With any radios other than these few Sony’s, you simply switch the antenna on and off manually. I spent several days comparing the two loops to each other. I used several different radios and although they reacted somewhat differently to the antennas, the antennas themselves seemed very consistent compared with each other. In other words, if the Sony was stronger on a given signal than the Degen with one radio, it would be the same with all of the radios. The differences were that more sensitive radios came closest to matching the loop antennas’ performance with their own whip antennas on some signals, but even the most sensitive radios showed some improvement with the loops on some stations. Of course, this is in wood-frame construction which does not attenuate the signals. In a steel-framed building, such as an office or hotel, either loop will let you “import” a stronger signal when mounted in a window than you would receive with the whip antenna inside the room. In that situation, either loop will bring in a much stronger, cleaner signal than you would hear otherwise. The loops are also inherently less susceptible to electrical interference than a whip or wire antenna, and each of the loops sometimes helped quiet the background noise level even in my average home setting. 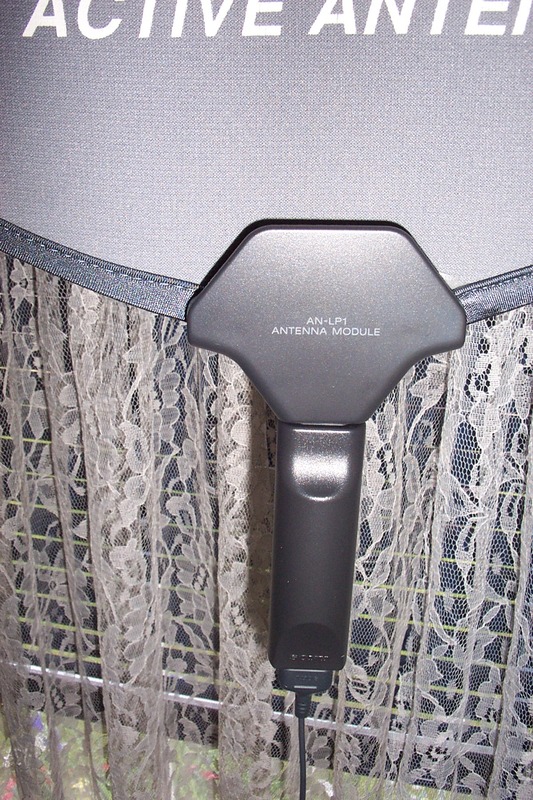 The ANLP-1 also includes a Noise Filter module which can be placed in the lead-in where it connects to the loop. A one-sheet included with the Owner’s Manual essentially says to use the filter unit if it is supplied…not terribly helpful or informative. It’s a passive filter network with minimal insertion loss and sometimes it seemed to help a bit but I’ve got to say its effects were relatively subtle, at least in my location. I also strung out two 23 foot reel up wire antennas of the type often supplied with portable sw radios as a reference. I deployed them in as close to opposite directions within my room as I could so I could see how much of a difference position made. During the tests I also repositioned each of the loops frequently to judge the effects. In general the signals did not require precise positioning, but occasionally local interference could be nulled by rotating or moving them. In most cases positioning was not very critical, and this is desirable since these are designed to be hung in a window. I used very weak to medium strength signals and a wide range of frequencies between about 5000 to 21,500 MHz, in some cases barely intelligible signals to hear very small differences between the two antennas. 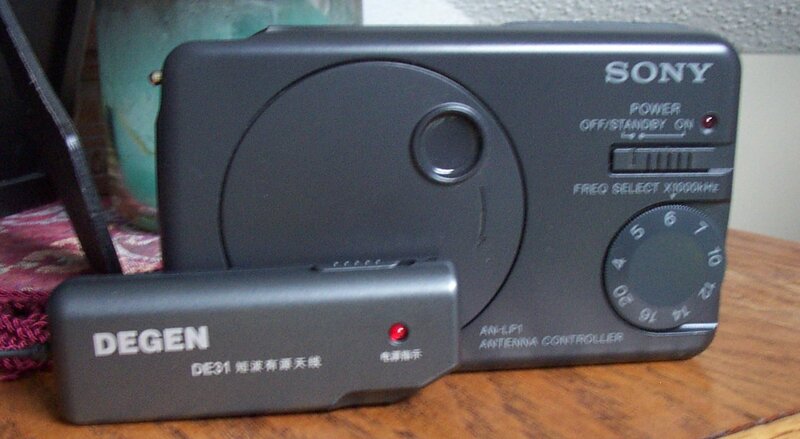 Comparing the two antennas, there was no doubt that the Sony generally outperformed the Degen, but not always by a big amount. Some signals were much better on the Sony than on the Degen…2 – 3 S units stronger, but some other signals were the same, both on the meter and in perceived reception quality. If I had to guess I would say the Sony has somewhat higher gain and perhaps a slightly lower noise floor, but because it only tunes in click stop settings some signals are not “peaked’ as fully as others, so it’s performance drops down to the level of the Degen. Interesting. The Degen’s thumbwheel requires patience and care to set exactly…its quite touchy on many frequencies. A steady hand and perhaps a decent signal strength meter can help you pinpoint the hot spot. The Sony is easier to click into a frequency range, but may not peak the particular frequency you want precisely. It didn’t matter though…the Degen never beat the Sony on any signal, and the Sony sometimes beat the Degen by a big amount. However, the 23 foot reel ups were in the mix too, occasionally delivering as much signal as the loops, but generally much less. They seemed to vary all over the place by comparison to the loops. This is also a well-documented characteristic of random wires used at high impedance. Their sensitivity rises and falls sharply as you sweep through the frequency ranges. (This can be remedied with a balun but that’s outside the scope of this article). As for the two reel-ups, there were occasional signals that were much better in one direction than the other, but the majority were similar. The $100 Sony ANLP-1 commands a premium price but delivers premium quality, design and performance. It is a great antenna, destined to become a classic in part for its totally unique design and is one of those products that are a pleasure to use. From my informal tests I would say its sensitivity should approximately equal a mid-length random wire…perhaps a 50 footer or more. If you are in a shielded building it will make the difference between clean reception and no reception on many shortwave signals. And it has some noise-nulling capabilities and pre-selection for improved overload protection. The $30 Degen DE31 at 1/3 the price of the Sony is a no-frills bargain. What it lacks in ease of packing for travel it makes up for in value…at $30 it will be hard to beat for its intended purpose. Its light colored “rope” loop may be considered less obtrusive looking than the solid disc of the Sony…it doesn’t block the window… and if you are going to leave it in one location the folding problem won’t bother you. It is not quite up to the performance level of the Sony…in this case the premium price does buy better sensitivity. The $10, 23-foot reel-up wire antenna is not too bad either, occasionally approaching the loops in signal level, if not in noise nulling capabilities. Of course you could put up a 20 foot or longer antenna from plain wire at almost no cost. Most bang for the buck…often they’re free with the radio, but definitely no match for either of these loops overall. Also the random wire will not work in a shielded room such as a hotel room or office building where window placement with one of the loops will bring in a stronger, less noisy signal.